This is an swing trend following strategy based on retracement trading method. Time Frame 4H or daily rime frame. but, to confirm the entry long at least two of the following conditions must be met. The Secret Trend indicator has dots dodger blue. After the conditions are met, we proceed to trade buy when the price retraces the pink line. but, to confirm the entry short at least two of the following conditions must be met. The Secret Trend indicator has dots red. After the conditions are met, we proceed to trade sell when the price retraces the pink line. Whit predetermine profit Target that depends by time frame and currency pairs. In the pictures belowThe Secret Trend Trading System in action. Share your opinion, can help everyone to understand The Secret Trend Trading System. 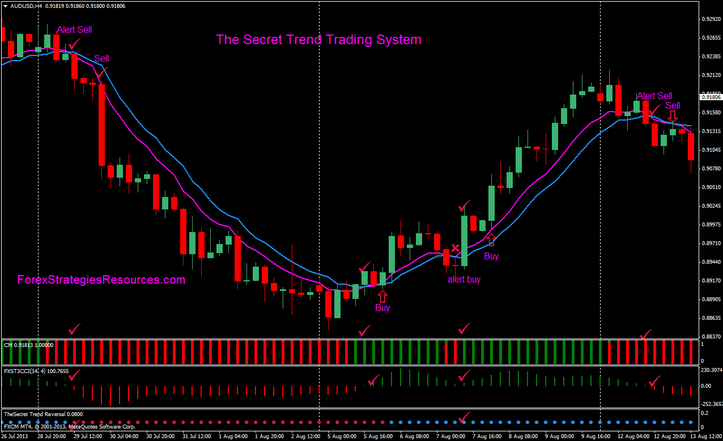 The secret trend trading system: Template and indicators. This solution is really great! I wonder why there are not more positive quotes. Best system on this page and probably best over all! 4 H ist best - 4 winner - 1 loser TP 30 SL 26. I agree with reanimator. It's one of the best online hands down. It's simple and to the point. I use it on the 1Hour time frame at certain key hours with 100% success rate..